Major upgrades to the Sony α9, α7III and α7RIII cameras (through firmware updates) were announced in San Diego on January 15. These upgrades will include major enhancements to autofocus performance. This includes the ‘Real-time Tracking’ mode for the A9 (as seen on the new α6400 camera). This mode utilizes Sony’s latest algorithm—including Artificial Intelligence-based object recognition—and processes color, subject distance (depth), pattern (brightness) as well as spatial (distance) information. 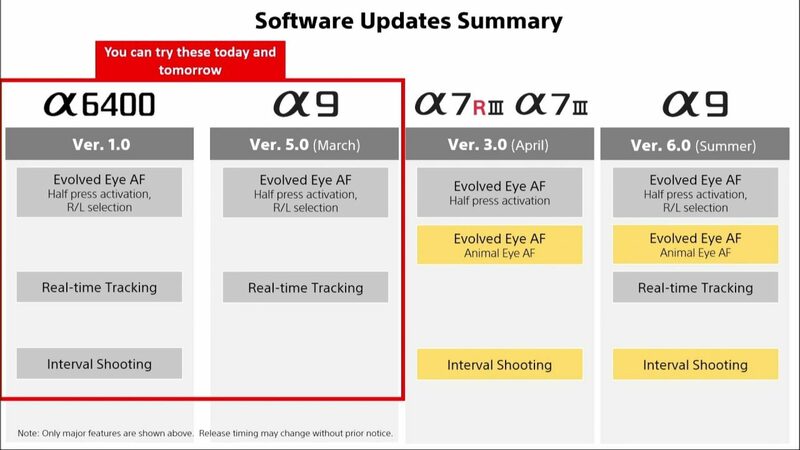 All the cameras listed will receive advanced ‘Real-time Eye AF’ or ‘Evolved Eye AF’ as Sony describe it in the Firmware roadmap. In all autofocus modes, the cameras will now automatically detect the eyes of the subject and activate Eye AF with a half press of the shutter button, and the camera will then track the eyes at all times when in AF-C mode. The new firmware will also enable photographers to select the preferred eye (left or right) of their subject as the focus point. The cameras will also receive ‘Interval Shooting’ functionality that will allow for simple creation of time-lapse movies. The new feature can be set for anywhere between 1 and 60 seconds, with a total number of shots from 1 to 9999. AE tracking sensitivity can also be adjusted to “High”, “Mid” or “Low” during interval recording, allowing for reduced changes in exposure over the shooting interval. The α9 will also receive some features that first made their appearance on the α7III and α7RIII cameras such improvements to Select Media and Rating + the My Dial functionality from the α6400 and is scheduled to receive the Animal Eye-AF by the Summer of 2019 (northern hemisphere season). 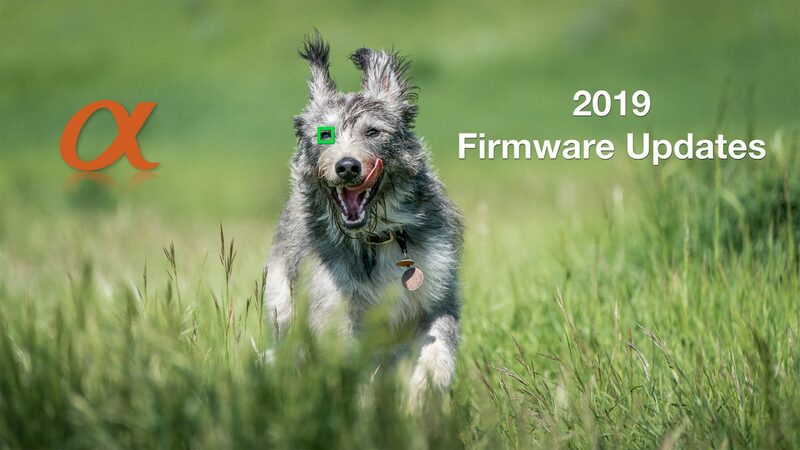 The new system firmware update version 5.0 for the α9 is scheduled for launch in March 2019 and version 3.0 for the α7III and α7RIII cameras is scheduled for April 2019. No news is forthcoming for updates to the α6300 and α6500 camera but this should not be ruled out. The list of updates for the A9 are very extensive and are listed at the bottom of this post. 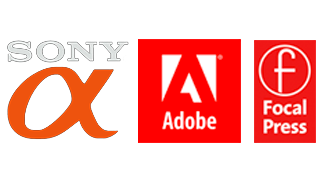 A newly introduced mobile application named Imaging Edge Mobile is the successor to Sony’s PlayMemories Mobile™ app and will offer instant transfer of images from camera to a connected mobile devices while shooting. Images can be transferred when utilising the new “Auto background transfer to Smartphone” functionality , allowing users to easily share content direct from their phone to social media platforms. The mobile application also supports 4K movie transfer and remote control functionality. For professional photographers, Sony will be releasing a new mobile application ‘Transfer & Tagging add-on ’ that will support instant delivery workflow by allowing users to transfer content to their mobile devices via the camera’s FTP background transfer , without distraction from their shooting. It also enables voice input for text captioning to help streamline communication and overall workflow. Sony’s new Imaging Edge mobile application and ‘Transfer & Tagging add-on’ will be available in March 2019. Sony is occasionally criticised for not rolling enough new features back (via firmware upgrades) to previous models. This is a major improvement that should be welcomed by all Alpha users (even if your model is not currently listed for firmware upgrade). There will of course be many models that will not be capable of being updated as the processing power of the cameras may not be fast enough to deal with modern AI technologies. The most notable feature that appears to be heavily processor dependent is Real-time tracking which may be limited to the α9 and α6400 and possibly all new cameras now release. This entry was posted in Announcements, Blog, E-Mount Cameras, Firmware and tagged A7iii, A7RIII, A9, firmware, updates.